Leader Al Riyadi delivered the eighth win on Monday night. This time they crushed 5th ranked Byblos (4-5) 93-64. It ended at the same time the two-game winning streak of Byblos. Al Riyadi dominated down low during the game scoring 58 of its points in the paint compared to Byblos' 34. They looked well-organized offensively handing out 30 assists comparing to just 16 passes made by Byblos' players. American guard Mark Lyons (185-89, college: Arizona, agency: Higher Vision Sports) fired 22 points and 5 assists for the winners. Nigerian power forward Christopher Obekpa (208-93, college: UNLV) chipped in 14 points and 9 rebounds (on 6-of-7 shooting from the field). Al Riyadi's coach Ahmad Farran felt very confident that he used entire bench which allowed the starters a little rest for the next games. 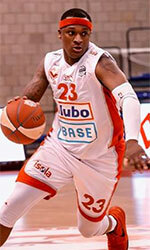 American forward Malcolm Riley (196-93, college: Texas Southern) produced 17 points and 6 rebounds for lost side. Al Riyadi have a solid three-game winning streak. They maintain first position with 8-1 record. Byblos at the other side keep the fifth place with five games lost. In the last two games of round 10 Moutahed were defeated by Champville in Dik El Mehdi 93-76. Beirut Club smashed Atlas F. at home 97-72. There was no surprise in Dik El Mehdi where 7th ranked Al Moutahed (3-6) was defeated by third ranked Champville (7-2) 93-76 on Saturday. Champville outrebounded Al Moutahed 48-29 including a 28-16 advantage in defensive rebounds. 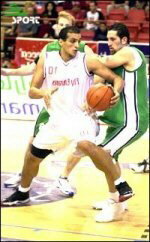 The former international forward Fadi El-Khatib (198-79) fired 25 points and 8 rebounds for the winners. International center Ater Majok (208-87, college: Connecticut) chipped in a double-double by scoring 16 points, 13 rebounds and 5 blocks. Four Champville players scored in double figures. American point guard Marvelle Harris (196-93, college: Fresno St., agency: Slash Sports) produced 34 points (!!!) (made all of his seven free throws) and his fellow American import forward Travis Franklin (200-88, college: Colorado St.) added 18 points respectively for lost side. Both coaches used bench players which allowed the starters a little rest for the next games. Champville have a solid four-game winning streak. They moved-up to second place. Al Moutahed lost third consecutive game. They keep the seventh position with six games lost. No shocking result in a game when fourth ranked Beirut Club (5-4) smashed at home 8th ranked Atlas F. (2-7) 97-72 on Sunday. American guard Chris Crawford (193-92, college: Memphis) fired 19 points, 6 rebounds and 7 assists for the winners. The former international forward Ali Haidar (201-90, college: Michigan Tech) chipped in 21 points and 6 rebounds. Four Beirut Club players scored in double figures. Beirut Club's coach Patrick Saba felt very confident that he used 10 players which allowed the starters a little rest for the next games. American power forward Darian Townes (208-84, college: Arkansas) produced a double-double by scoring 19 points, 16 rebounds and 4 assists and his fellow American import guard Ghassan Nehme (190, college: Fair Dickinson) added 17 points, 5 rebounds and 4 assists respectively for lost side. Beirut Club maintains fourth position with 5-4 record. Atlas F. lost third consecutive game. Newly promoted team keeps the eighth place with seven games lost. Leader Al Riyadi delivered the eighth win on Monday night. This time they crushed 5th ranked Byblos (4-5) 93-64. It ended at the same time the two-game winning streak of Byblos. Al Riyadi dominated down low during the game scoring 58 of its points in the paint compared to Byblos' 34. They looked well-organized offensively handing out 30 assists comparing to just 16 passes made by Byblos' players. American guard Mark Lyons (185-89, college: Arizona, agency: Higher Vision Sports) fired 22 points and 5 assists for the winners. Nigerian power forward Christopher Obekpa (208-93, college: UNLV) chipped in 14 points and 9 rebounds (on 6-of-7 shooting from the field). Four Al Riyadi players scored in double figures. Al Riyadi's coach Ahmad Farran felt very confident that he used entire bench which allowed the starters a little rest for the next games. American forward Malcolm Riley (196-93, college: Texas Southern) produced 17 points and 6 rebounds and the former international point guard Rodrigue Akl (187-88) added 8 points, 5 rebounds and 10 assists respectively for lost side. Al Riyadi have a solid three-game winning streak. They maintain first position with 8-1 record. Byblos at the other side keep the fifth place with five games lost.